Anita Lieberman Katz was a clerk who worked on the Manhattan Project from May 1943 to January 1946. She was born in New York City in 1920 and graduated from Hunter College. 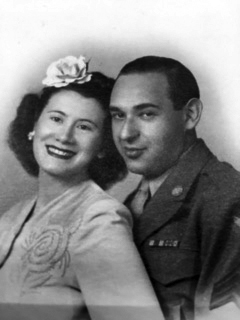 She married Nathan Katz in mid-1943 during a brief leave from his military service. 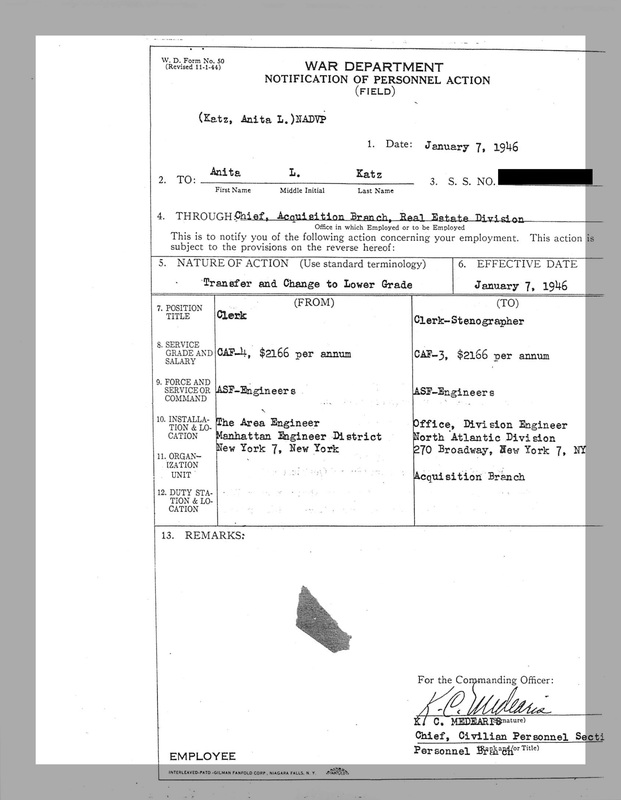 After her husband deployed to Europe as part of the 8th Air Force Bomber Squadron, Katz sought out work and was notified by a family member of an opportunity with the Kellex Corporation in Manhattan. She was surprised to be interviewed by an Army officer. This interview was only the first of several unexpected aspects of her new job, another being that her workplace wasn’t listed in the building directory. These unusual situations were her first hints that her employers were involved in a secret project. The work her office was doing only became apparent once the US bombed Hiroshima on August 6, 1945. 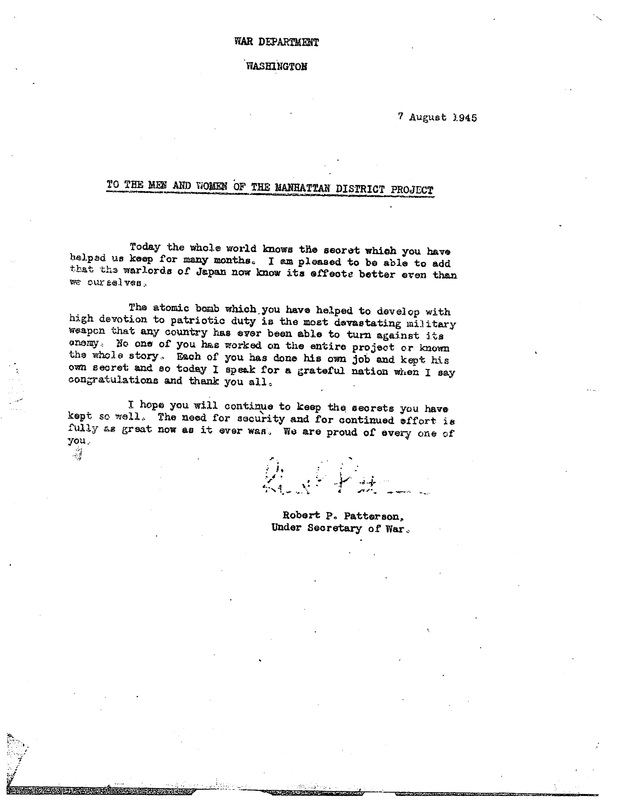 While some of the secrets of her work were now out in the open, she and other Manhattan Project employees still had to be tight-lipped about the subject matter of their jobs, as shown in the notices (see gallery below) from Manhattan Project officials to maintain secrecy. 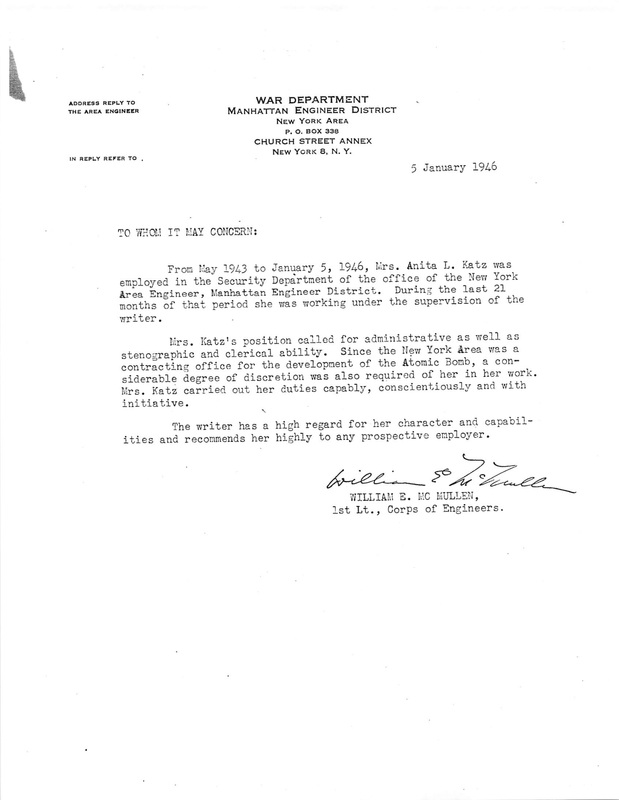 Following her discharge from the Manhattan Project in January 1946, Katz attended Hofstra University and received a Master’s degree. She later worked a variety of jobs, including as a substitute teacher, and on several volunteer initiatives. She raised two children, Edward Katz and Lynne Ende, on Long Island. At age 90, she returned to Manhattan, where she died in 2015. Information contributed by Anita's daughter-in-law, Marilyn Machlowitz. Letter of appreciation Katz received from Col. Nichols. Memo received from Undersecretary Patterson urging employees to continue to keep secrets. 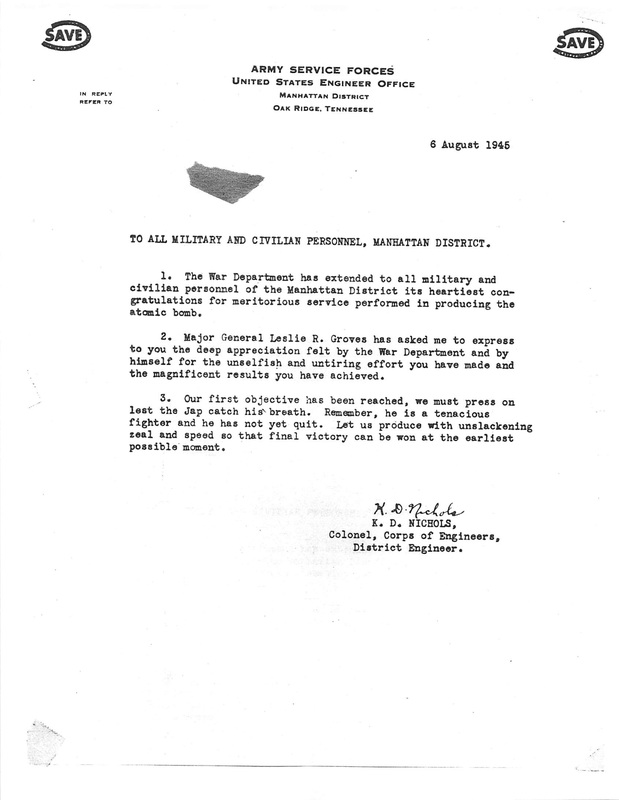 Letter of recommendation for Katz written by Manhattan Project engineer Lt. William McMullen. 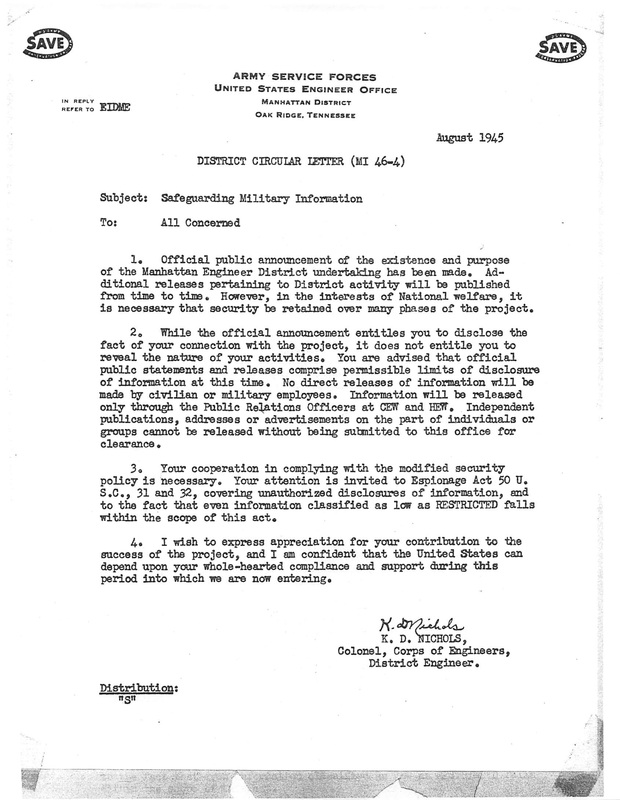 Memo from Col. Nichols regarding secrecy and appropriate disclosure of Manhattan Project information. Form officiating the transfer of Katz away from the Manhattan Engineering District following the end of the war.